Every year at birthdays and Christmas I get tired of bringing more stuff into our home that will be played with for a little while, then be totally forgotten and eventually in the back of my car on the way to the thrift store. Over the past couple of years I have been investing in gifts that I know my children will not only love but will inspire creativity and learning. Whether you have boys or girls, older children or younger this list will be sure to have something for everyone. Disclosure: Links in posts are to amazon. I recieve a small commission every time you click on a link and purchase a product. Thanks for supporting our home and homeschool! With my children ranging from 11-3 I try to find gifts that they can all use together or at least share. 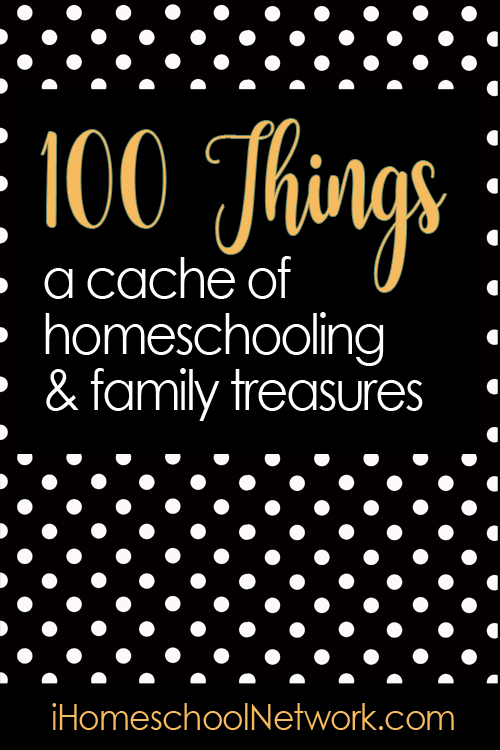 Not only do I want to encourage my children to be always investigating and discovering on their own but I want to give them the tools and resources to do so. 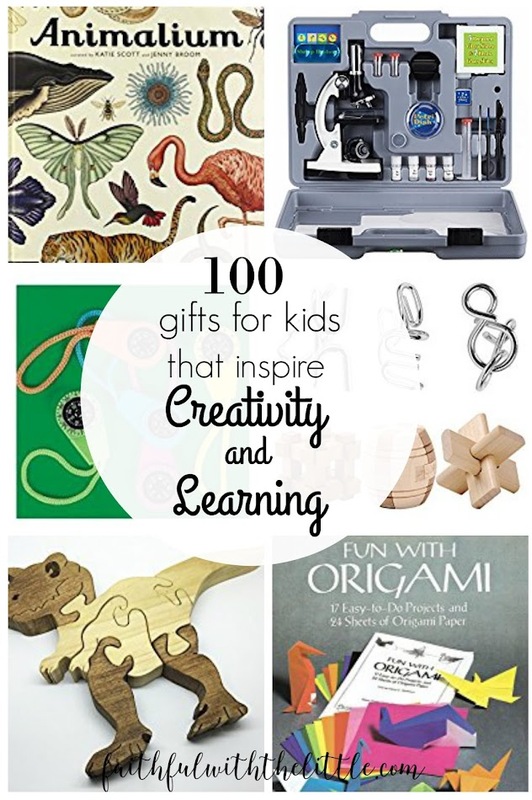 Here is a comprehensive list of a 100 gifts that will be sure to light up any child's imagination and creativity! I am so thankful that my kids love to be outdoors! They especially love studying nature and catching creatures. Here are some gifts that my children never tire of using to explore and discover. My husband is an avid hunter and fisherman. You can be sure that my kids are following right in his footsteps. They love being outdoors and love catching wildlife, whether it's to eat or just observe for a while. Usually every year they ask for one of these items for gifts and use them till they can't be used anymore. I feel like they learn so much through being outside, catching critters and studying the outside world! I am pretty sure one of my kids will be a biologist some day. My kids can not get enough of nature books. Whether it's a nature encyclopedia or colorful nature picture book; I love finding them pouring over these books for hours. All of our nature books are dog eared and ripped from so much use! My kids got a microscope last year and continue to find things that they want to take a closer look at through it. I often find them running in the house with a bottle of dirty water, butterfly wings and even bugs to put under it. I am so glad that they love to discover what's unseen to the naked eye and dig under the surface to find out information for themselves. I am sure your kids will love these gifts as well if they are as inquisitive about our world as my kids are. My kids love doing puzzles. The big ones have been obsessed with the rubix cube and the little ones love regular puzzles. 8. Learning Resources Gears! Gears! Gears! On a daily basis my kids ask me to do crafts with them. I have to admit that although I love getting crafty, time doesn't always allow for me to put a lot of time into coming up with great crafts every day. This list has some books and crafts that they can do on their own as well as with an adult. I try to provide them with the resources they need and then let them go to town(within reason) crafting! Lately my kids have been obsessed with origami. They have already made every origami project in the books below and have even invented their own. Give your kids the supplies and watch them create! We have a house full of artists. I have always loved art and am so glad my kids have been given such amazing God given talents. They constantly ask me for new supplies to feed their need to create. We have invested in a lot of paper and art supplies over the years but I can't think of a better investment. This list has some great quality supplies that will last your little artists for a long time to come. Kids love to invent and get technical. It's been so cool for me to learn alongside of them about how things work. Here are some great tools and kits to push you and your techy kids in the right direction if they are curious as to how things work and want to make their own observations and inventions. We have so many great resources right at our fingertips. Let's make the most of them and use them to encourage our kid's creativity and learning! I am teaming up with some amazing bloggers to give 2 lucky winners $100 each with their choice of paypal or amazon gift card! AND!! !...also giving away a $15 amazon gift card here on my blog!! Click on over to ENTER THE GIVEAWAY and check out some other great posts on 100 things! Such a great list! Pinned. This looks like a great list. I'm not quite ready to shop yet, but I'm saving for later! Love these ideas! Battery operated toys get played with a couple of times and tossed aside, but these creative toys are played with for ages. Yes! I love seeing my kids play with toys that their siblings have already loved and put so much use into! These are all really great ideas! Thanks so much for sharing with us at Share The Wealth Sunday! Wow, what an amazing list! Thanks for sharing. Love the puzzles and brain teasers!!! I'll definitely have to keep this list handy.